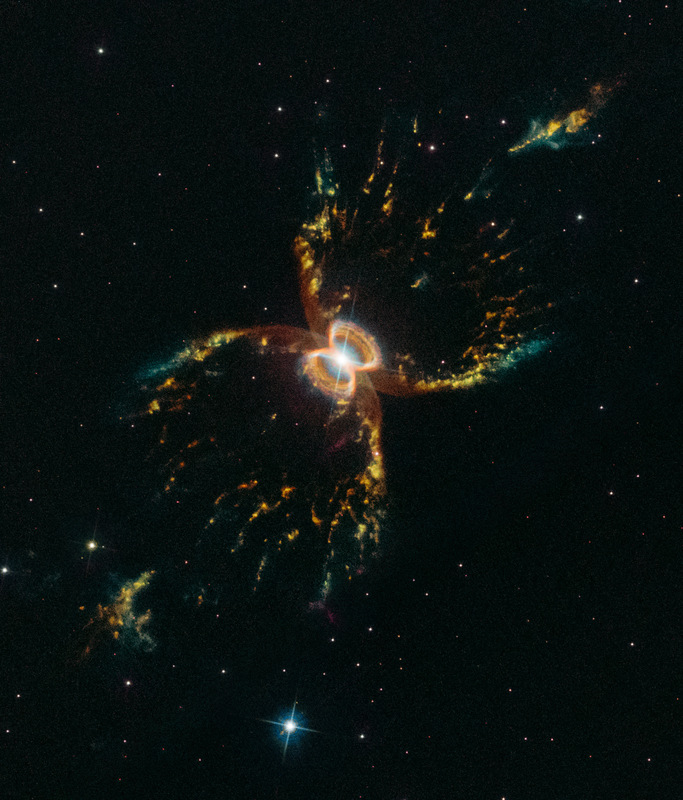 Explanation: The symmetric, multi-legged appearance of the Southern Crab Nebula is certainly distinctive. About 7,000 light-years distant toward the southern sky constellation Centaurus, its glowing nested hourglass shapes are produced by the remarkable symbiotic binary star system at its center. The nebula's dramatic stellar duo consists of a hot white dwarf star and cool, pulsating red giant star shedding outer layers that fall onto the smaller, much hotter companion. Embedded in a disk of material, outbursts from the white dwarf cause an outflow of gas driven away both above and below the disk resulting in the bipolar hourglass shapes. The bright central shape is about half a light-year across. This new Hubble Space Telescope image celebrates the 29th anniversary of Hubble's launch on April 24, 1990 on board the Space Shuttle Discovery.